I. 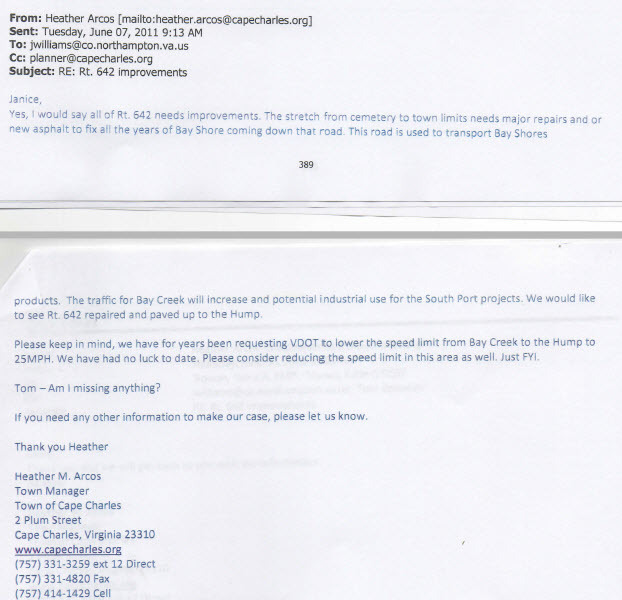 Have VDOT attorneys reviewed the Annexation Agreement between the Town of Cape Charles and then developer Brown and Root? VDOT attorneys neither reviewed the Annexation Agreement nor were they aware of any obligations thereto, prior to or at the time of the project. As a result of this inquiry, our attorney obtained and reviewed the Annexation Agreement. II. Does Bay Creek South, LLC, as successor in interest to Brown & Root, Inc., Brown & Root I, Inc. and Kellogg, Brown & Root, Inc. as developer and primary owner of Bay Creek, have an obligation to construct VDOT Project No. 0642-065-577 (UPC103391) at its sole expense? 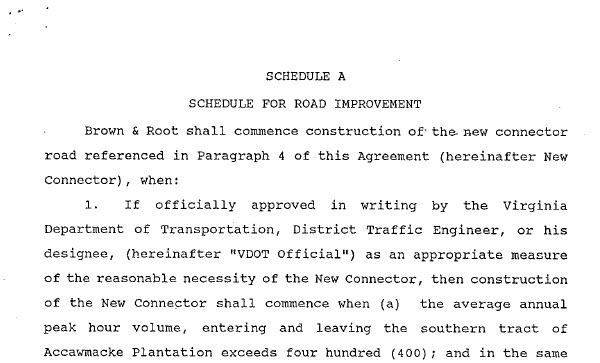 VDOT believes that Bay Creek South, LLC has a legal obligation to construct VDOT Project No. 0642-065-577 (the “Project”) at its sole expense. 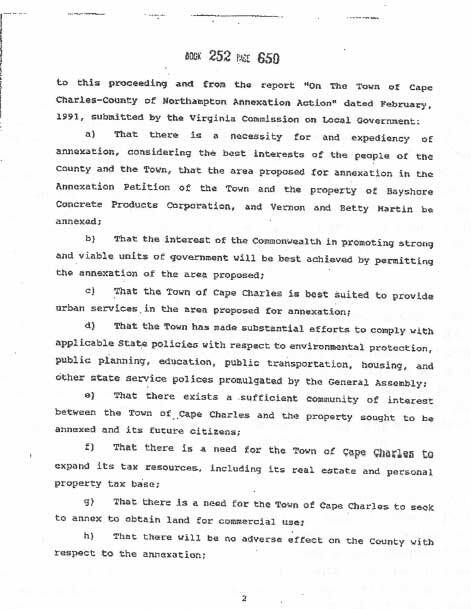 The Report of the Commission on Local Government on the Town of Cape Charles – County of Northampton Annexation Action dated February, 1991 (the “Report”), which was incorporated into the Annexation Order by reference, contains strong language providing the justification for placing the burden to construct and pay for the Project on the developer of Bay Creek. 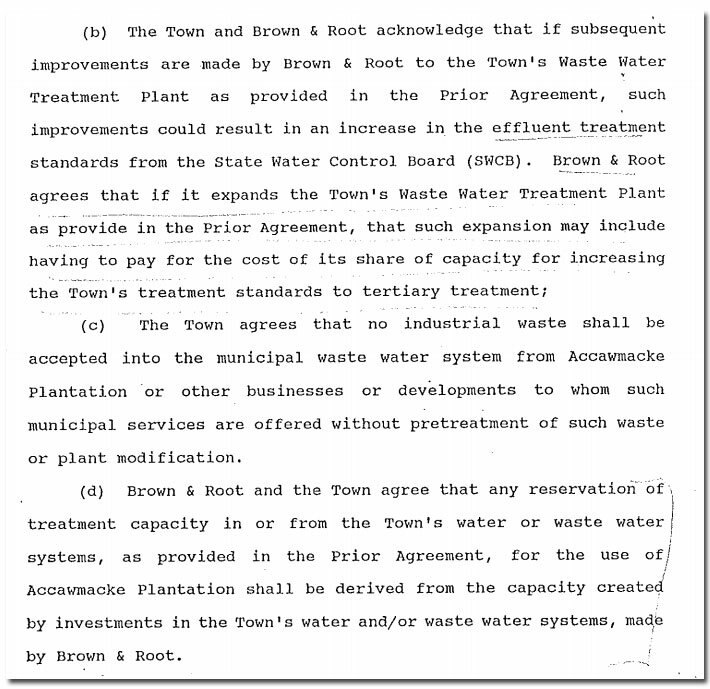 There is also a referenced Agreement between Brown & Root I, Inc. and the Town of Cape Charles (the “Town”) dated March 13, 1990 (the “Developer’s Agreement”), an Amendment to the Developer’s Agreement dated November 25, 1991 (the “Amendment”) and an Agreement between the Town, Northampton County (the “County”) and Brown & Root I, Inc. dated November 25, 1991 (the “Town-County-Developer Agreement”), all of which are incorporated by reference into the Annexation Order or Amendment. 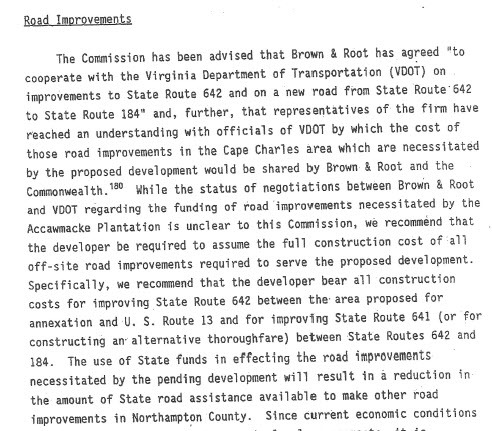 III.Why didn’t VDOT know about the Annexation Agreement between the Town of Cape Charles and then developer Brown and Root? There are 3 project parcels at issue, Parcels 004, 006 and 010. Parcels 004 and 006 were handled by Northampton County. Acquisitions activity on these parcels, including Title research, was not performed by VDOT and the title report reviewed by VDOT did not reference the existence of any proffers. Although VDOT did handle Parcel 010, in searching for the existence of proffers, VDOT must rely on the responses from localities where any such proffers might be present. We ask for written responses from Planning Departments as part of our diligence. VDOT asked the County to provide any information regarding zoning restrictions, special use permits, unrecorded proffers and open zoning cases concerning parcel 010 and we were told that none of those were applicable to Parcel 010. As a result, any related Annexation Agreements were not known to us. Thank you so much for the response, it is much appreciated. 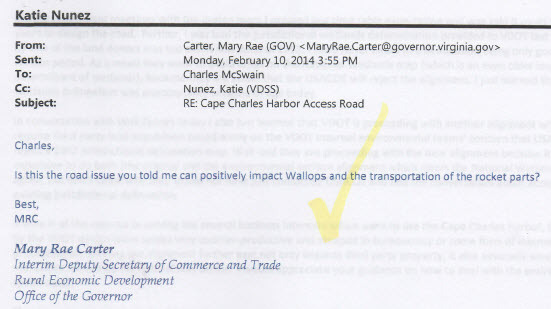 Given VDOT attorneys feel the developer has a legal obligation to construct VDOT Project No. 0642-065-577, what are the next steps? Will there be a stop-work order while this is hashed out? 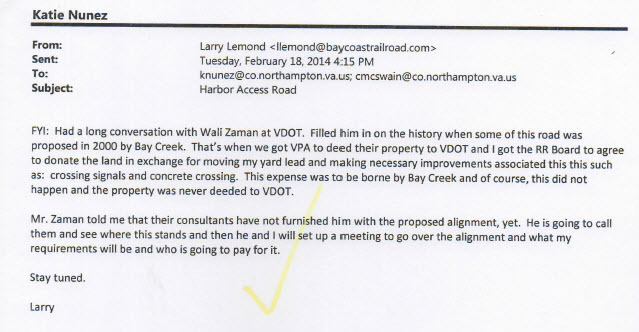 One question the attorneys should ask is why VDOT was not made aware of the annexation agreement by the Mayor and Town Council of Cape Charles, as well as Northampton County, and was allowed to fund this project using taxpayer funds when they were fully aware of the agreement between the town and then developer Brown and Root. I can provide correspondence going to back to 2004 which can verify this. Also, the current County Attorney should have been aware since he was the person that signed the annexation agreement in 1991. VDOT contacted the Mirror on January 12, 2017, at 9:00 AM per Paula Miller, Communications Manager for VDOT Hampton Roads. While VDOT attorneys agree that the developer Bay Creek South should be funding this project in whole, since they were not party to the agreement, their hands are tied in terms of enforcing it. According VDOT, only the Town or the County can enforce it. The Mirror asked how VDOT came to its determination, as well as whether it was their decision not to attempt to find out why they were not made aware of the Annexation Agreement during planning phases. This information was not available at the time. Who will finally enforce Law No. 27, the Annexation Agreement between Cape Charles and Northampton? Right now, the taxpayers are on the hook to pay close to $11 million for a roadway that, according to VDOT attorneys and a legislative act of the state of Virginia, the developer, Bay Creek South, LLC is responsible for (as well as a $20 million wastewater treatment plant that was also part of the agreement). 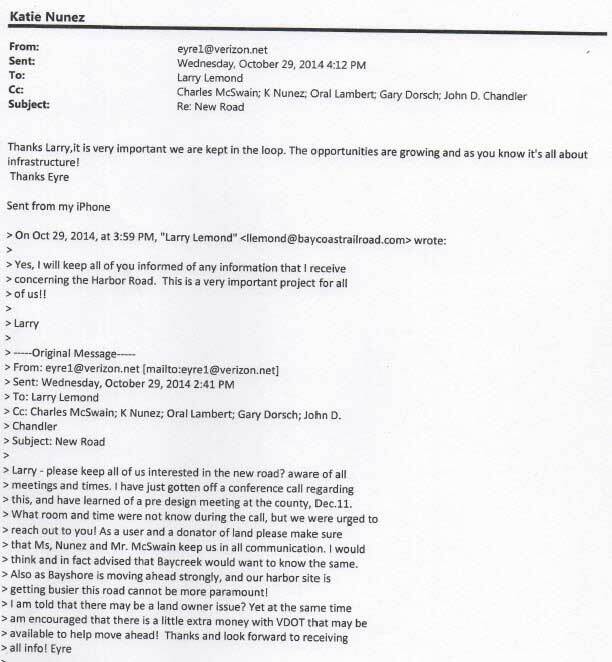 Note: The Annexation Agreement “runs with the land”. 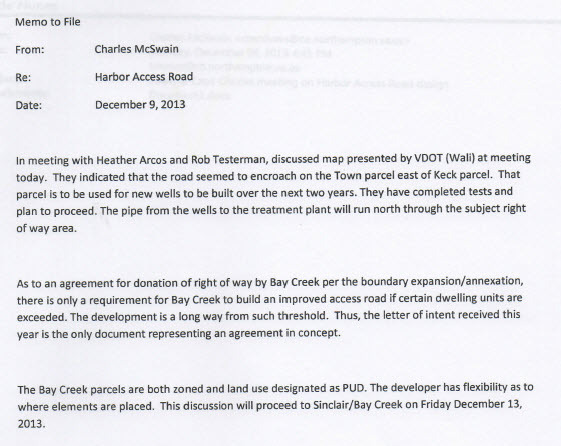 That is, when Sinclair Communications purchased Bay Creek South, they also assumed responsibility for the agreement between the Town and the County. Bay Creek South changed hands and control on March 8, 2008, into Sinclair. Sinclair even had an Earning Conference call along with their earning release announcing the great deal they had made in Cape Charles. At the time, Sinclair seemed pleased that for $50m they acquired a 50% controlling interest in a property appraised at over $200m. While the purchase may have at first appeared to be a good deal, it may turn out to be more a “pig in a poke”. Of course, the developers and the town council members that reside in their pockets will tell the road was needed for the harbor, and all the important work going on there. Infrastructure is everything (see Eyre Baldwin’s email in the below mosaic). Well, Bayshore is history, so all that of the harbor is a proposed terminal, a boatyard, and a small restaurant. You really needed a detour for that? Everyone, from town and county government, all way to state-level attorneys, to the former and current governor mansions are all aware of this. Basically, you have been thrown under the bus. The land use map clearly shows the connector road as part of the plan. The developer, in the annexation agreement, pledged to build the road at its expense. 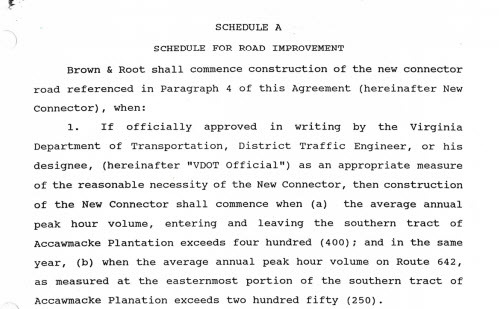 1991 Annexation Agreement, Law No.27, road schedule. “Lies, fraud and corruption” sums it up. Thank you for being on top of this and summarizing this travesty in a single article. Sinclair Communications is this company — http://www.sinclairstations.com — not Sinclair Broadcast group, correct? How was my comment not civilized? I don’t care about the race, income level, preferred recreation, or clothing choices of the Bay Creek population. I care about how the road is funded. The documentation Wayne provided shows fraud and corruption. Taxpayer funds are paying for a new road that multiple legal documents state was to be paid for by the developer. Somehow that cost was handed off to taxpayers. Bay Creek homeowners pay taxes and increase the tax base. The golfers are all races. To make this a racial statement is not accurate. I have been witness to this as golfers headed out for Tournaments. 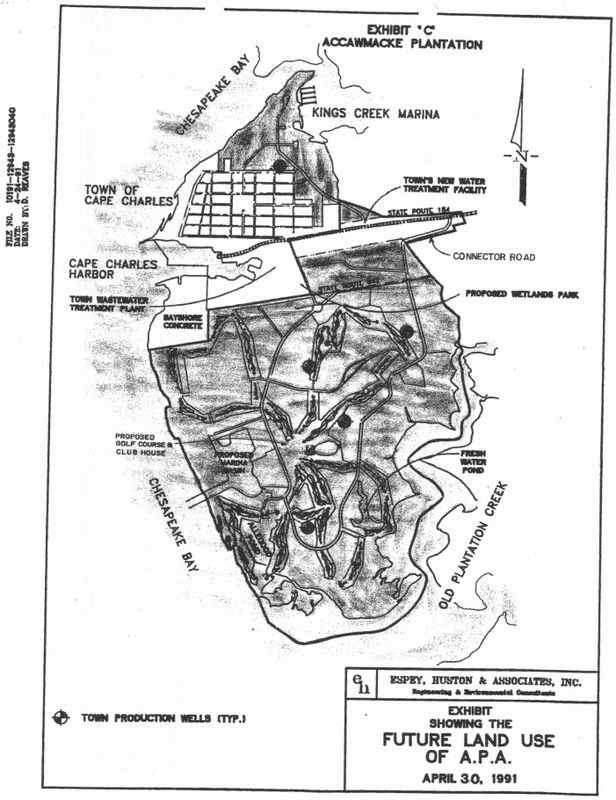 Why would ypu want to creste a hostile rnvironment woth another section of Cape Charles. All of the bay Creek tesidents have a city adress of Cape Charles. They ate part of the city. Time to be inclusive not separtist with inaccurate racial and judgemental statements about poeples clothing. Racial Statement????? You sound like a liberal democrat, the greatest threat to our nation. I bet you voted for the mulatto and hillary. Actually, I voted for Trump. The racial statement I referred to was” rich white golfers with ugly pants”. In addition, I have a son and grandson who are of mixed race. Hmmmm. Interesting. Note: According to the National Golf Association, of the 25.7 million golfers in the U.S, 21 million of those are considered white. At Bay Creek, just to join is $25k, with close $400 a month in fees. Just to play a round costs $115. Playing Bay Creek is not for the financially faint of heart. We can probably debate the wardrobe critique (I think we’re accurate there too), but the rest of the numbers speak for themselves. Those numbers, $25,000 up front, $400 monthly maintenance, and $115 per day for gas/bait/ect are right in line with a very modest boat. Golf is a silly game played by rich white guys (and those that want to appear to be) sometimes wearing ugly pants. At least those pants cover their rear ends. My name is an old English name. The name of Prince Williams sister in law is Phillipa. Sounds mighty highfaluting to me. I mean really, who cares about some prince’s sister in law? All I know is that the English Army killed many Americans. Remember The Battle of Camden on August 16, 1780. I have no love for the Brits, nor fascination with their so called royalty. But if you insist that we re-visit 5th grade social studies and share our special fact of the day, then I’ll be sharing with the class the origin and reality of this so called “wacky sport played by rich white people.” Dating back to the 15th century — way before your beloved Minutemen — golf was first introduced in Scotland. It didn’t take long for the creative game to go public, becoming one of Western Europe’s most popular past times. Golf was enjoyed by all classes, rich and poor. Although the nobility and even Scottish King James II favored golf, the majority of participants were made up of the poor peasantry. Obviously golf has changed a lot over time and is an international sport today. But the love for the game remains the same as men and woman of all ethnic backgrounds continue to appreciate this sport. Wow! Pretty neat, right? Anyways, it’s one thing to make a reference that has no relation to your life, but being down right childish and disrespectful, and to take the time out of your day so you make someone else feel unimportant and inferior is just unfortunate. Oh, and Ole Lil Wayne has no room to talk about Bay Creek residents about age “old” when isn’t exactly living his youthful days anymore either and he sure as hell doesn’t own a pair of good looking trousers. My ancestors fought and died in every war this country has been involved in with the exception of the middle east. You would do well to appreciate that. If you would like to have an adult conversation, leave a number where you can be reached. Note: Mr. Ford, this person did not use their name, and used a false email address. I doubt they have the courage to leave a phone number for you. ” Rich white golfers wearing ugly pants.” I’m white and that is offensive. Other races don’t play golf? Wow. Just wow. But, you are a liberal, none the less. I awoke this rainy Spring morning, poured myself a cup of coffee, and opened up my emails to catch up with world and local happenening curtesy of the Mirror. I was reading about the new road when this phrase “ Soon, the fairways of the Palmer and Nicklaus courses will be brimming with rich white golfers wearing ugly pants–. shocked me awake. In the climate of ULTRA polical correctnes to see, in writing , the use of a racial socioeconomic stereotype sent me into a rage. I thought we have moved beyond such prejudge and labeling. If any other group was describes by tradition stereotyping, there would be outcries and marches down Mason street. Sometimes the ‘50s And ‘60s thinking rears it’s ugly head. Why are Bay Creek residents consistently painted as interlopers in the wonderful town of Cape Charles? We pay town and county taxes, town utilities, and contribute economically to the well-being of the area. Surprisingly, not all of us are rich, nor golfers, nor wearers of funny pants. You would do well to use the vehicle of the “Cape Charles Mirror” to foster an inclusive environment in the town, instead of constantly raising class and race and political differences to divide us. I thought this article was about the $11 million road, and how it was now being paid for by citizens’ tax money and not the company. How did it ever become about race? One person mentions one thing, and like sheep everyone follows losing sight of the real issue here. Bay Creek homeowners are not the only ones paying for this Phillippa so just because they may raise the tax base doesn’t mean they are the only citizens having taxes withdrawan for the “byway”. People need to wake up around here. A small elite is making big plans right under everyone’s nose with dollar bill signs in their eyes. They claim it is to bring money and jobs to the area yet most positions are filled by a person out of the area. The only people profiting are themselves, and using tax payer money is not helping locals’ economically. Not to mention they are ruining the quaintness of the area which is what makes it special in the first place. The byway is by no means quaint. It is great to hear from people who are committed to the betterment of the community. Looking forward to working for the betterment of all. What do you consider the betterment of all for the Eastern Shore Community? How about building a new middle and high school for our children! That is where the 11 million should have went! That certainly would have made sense if there was a genuine concern for Eastern Shore residents. Educational improvement for our children. The school system for atleast 10 plus years have been getting consults on repairs and new buildings. But have yet to do a thing about it yet. They will not raise taxes for the new school. But found the money to build a new jail and money to renovate the administration building. For get about CIP the school should have gotten the money first! All along for those we hold dear our kids we will keep them in a falling down building. How many consults, groups and people do you need to say we need the new buildings and we need them now. Or do we wait until the building collapes and we are looking for our children among the rubble. Seriously what was the purpose of having a new road going to Bay Creek? There was already Rt 184 and Old Cape Charles Road. The emails were from 2014, look at Bayshore Concrete now. Look at our schools! That is where this $11 million should have gone! The Eastern Shore is an old place with ‘old roads’ and a place to come and retire. Why change what was already fine? Where you need to start putting money is in places that NEED it!! Stop throwing money on things that don’t need to be. Education and schools come FIRST!! It is time the stop the rumors, innuendoes, half truths and character assasination concerning a road. It’s built, it’s there, it’s not going away. And if people want to wear funny clothes, so be it. Many people think I dress like a clown in the summer. It so happens my favourite color is Madras. Instead of commenting in the Mirror, put some Jimmy Buffet on, mix up a frozen Margarita and chill! I bet you voted for the obama and hillary too.